Don’t Miss the Conversation Because You’re Outside Grilling! Previously I spoke about the most popular outdoor living space, the Outdoor Great Room. 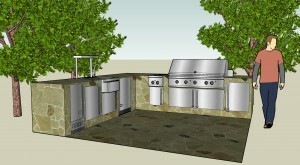 The second most popular space is the Outdoor Kitchen. What conversations do you miss out on because you have to keep stepping outside to check on the grill? Maybe your friends hang outside with you while you grill, but you have to keep stepping inside to get food from the fridge, or use the sink, or get ice. This rendering shows a complete kitchen outside with everything you need to prepare your whole meal. As a bonus, there is plenty of room for your friends and family to join you outside in your Outdoor Kitchen to socialize while you prepare the meal. If your Outdoor Kitchen is simply a barbecue on your deck or patio, then you are missing out on the conveniences and comfort of an outdoor living space. Add the walls and ceiling, like we did here with the counter and the trees, and then add the conveniences for the space, like the sink, side burner, fridge, ice maker and cabinet space, and you have a complete, convenient and comfortable Outdoor Kitchen. « How to Host a Great Outdoor Party!